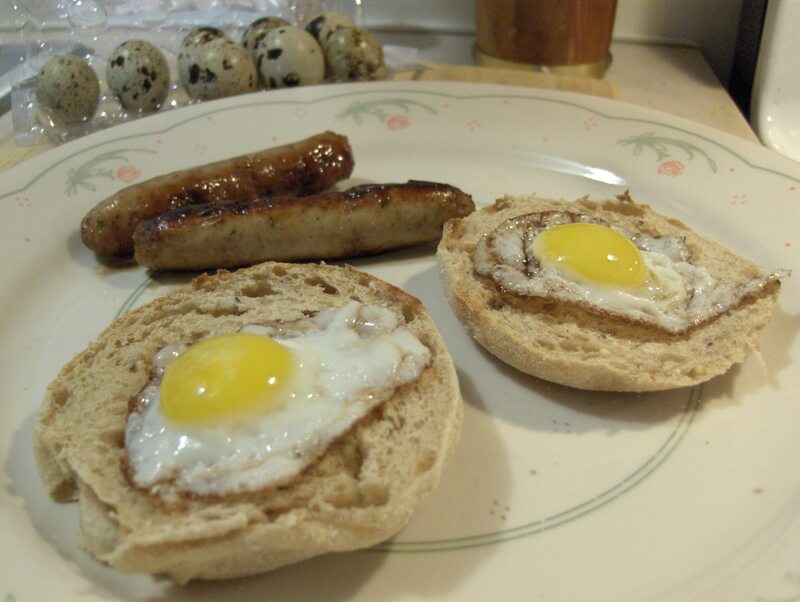 Had a first for breakfast this morning, Quail Eggs! I picked these up at Jungle Jim’s yesterday. I had always wanted to try them and they had plenty in stock. To open the Egg you have to take a knife and carefully puncture the big part of the Egg at the top. Then remove the top of the Egg so you can pour the Egg out of it’s shell into the skillet. If you fry it, which is what I did, it will fry in about 45 seconds. They are the perfect size for you English Muffin! I’ll try them a differnt way tomorrow for breakfast. I had Bob Evans Turkey Sausage Links and a Healthy Life Whole Grain English Muffin also. A little background on the Quail Egg! Quail eggs are considered a delicacy in many countries, including western Europe and North America. In Japanese cuisine, they are sometimes used raw or cooked as tamago in sushi and often found in bento lunches. In some other countries, quail eggs are considered less exotic. In Colombia and Venezuela, a single hard-boiled quail egg is a common topping on hot dogs and hamburgers, often fixed into place with a toothpick. In the Philippines, kwek-kwek is a popular street food delicacy, which consists of soft-boiled quail eggs dipped in orange-colored batter before being skewered and deep-fried. In Vietnam, bags of boiled quail eggs are sold on street stalls as inexpensive beer snacks. Quail eggs are often believed to be very high in cholesterol, but evidence shows their cholesterol levels are similar to chicken eggs. 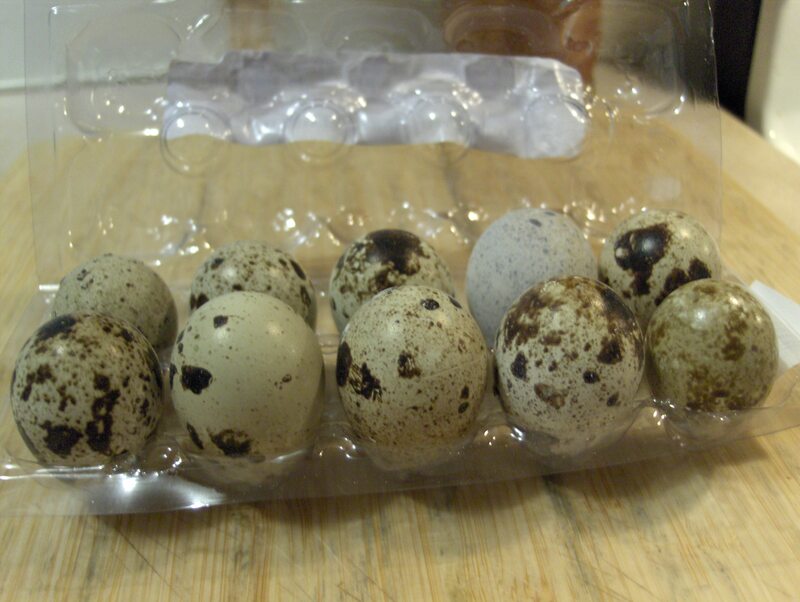 A few other facts about Quail eggs from the Healthier Quail Eggs web site. I left the link to the site at the bottom of the post. Few foods can claim the nutritional value and of a quail egg. As an enriched source of anti-oxidants, essential fatty acids, and Vitamin B Riboflavin, it’s often the natural food of choice for medical cures, relief from inflammatory diseases and strengthening our immunity systems. These and other food nutrients further contribute to brain development, sexual potency, glowing skin and healthy hair. And it does this with practically no carbs, no bad cholesterol and food spoilage. Now imagine all of this from a product known for its 5-star elegance and cultural exquisiteness. Quail eggs improve skin color and strengthen hair. That’s why quail eggs are used for egg yolk facial and hair care masks. Its Vitamin B2 Riboflavin provides glowing and healthy skin, while the Vitamins A, B and E give your child shiny and voluminous hair. All this from a 100% natural alternative to harmful hair and skin care chemicals. Quail eggs are also rich in ovomucoidproteins, antioxidants and lysozyme. As a sugar-free, non-processed source of these nutrients, this makes quail eggs ideal for controlling infections and inflammations leading to asthma, allergies, eczema and psoriasis. Came across the Bob Evans Turkey Sausage Links last week at Meijer and I really llike them. They come 10 to a box and Fully Cooked so their a breeze to prepare. Warm by microwave (1 minute) or in a skillet (8 minutes). They taste fantastic! I prefer warming them in a skillet. Plus their only 70 calories and 0 carbs per serving (2 Sausage Links). I had them this morning with a Healthy Life Whole Grain English Muffin. I’ll be stocking up on these. Turkey, Water, Sea Salt, Contains 2% Or Less Of The Following: Cane Sugar, Natural Flavoring, Spices, Formed In A Collagen Casing. 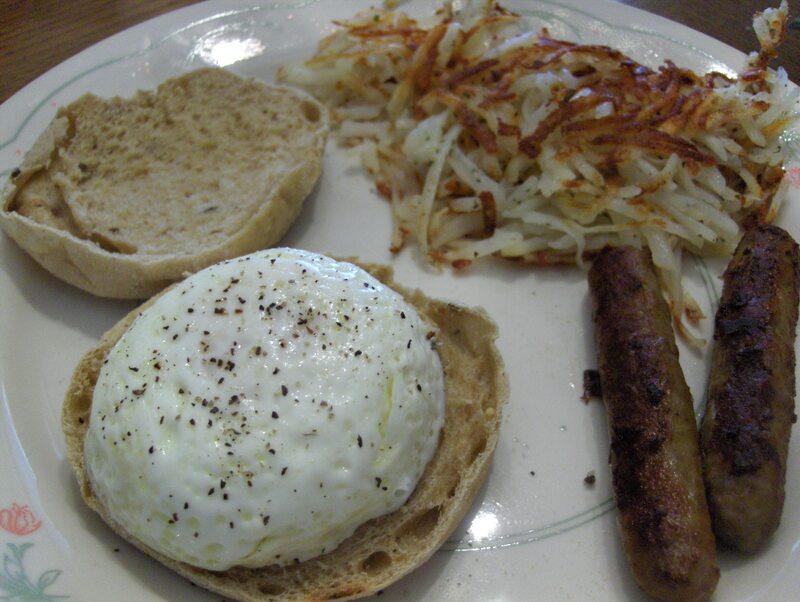 Today’s Menu: Poached Egg on English Whole Grain Muffin w/ Hash Browns and Turkey Sausages. Breakfast food just isn’t for Breakfast anymore! I was trying to come up with something for dinner tonight. I layed some Scallops and Rainbow Trout out but it just wasn’t what I wanted that’s when a Breakfast Dinner came to me and sounded exactly what I wanted. So I Poached an Egg about 3 1/2 to 4 minutes. I served that on top a Healthy Life Whole Grain Muffin. I had sides of Simply Potatoes Hash Browns and Jennie – O Turkey Sausage. Easy to fix, healthy, low cal, low carb Breakfast at Dinner.